The center of the room showcases one of four beds Passal designed for Savoir Beds (the daybed is also theirs) in a lush green Schumacher velvet. Since the beds are an investment, the designer thought it would be fun if they had memorable names – this one is “Who’s Your Daddy” – are you sensing a theme? The exotic dresser adds a decorative detail against the architectural curves of the overscaled mirror. A saw horse desk from Profiles with skirted Hickory chair is appropriately casual for a beach house yet provides a place for Hunter to work on racking in the big bucks and for Bianca to find some online inspiration :-). I love the textural Mimizan Ceramic Vase lamp from Vaughan (in fact they provided all lighting except for the small yellow lamp on the dresser above). Passal continues the story down to the details. 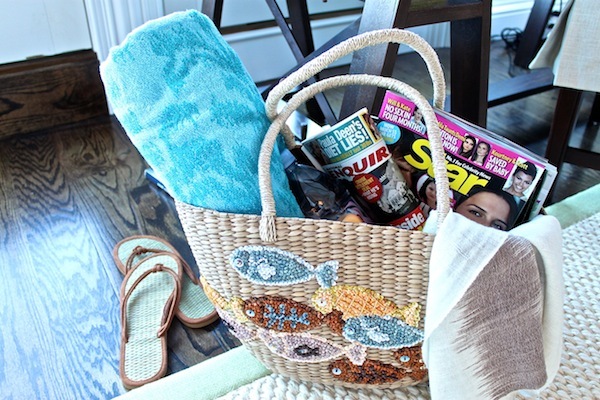 As you can see, Bianca has some very literary reading material ready for her time poolside, although I do like the bag! Vignettes both large and small include delightful details. 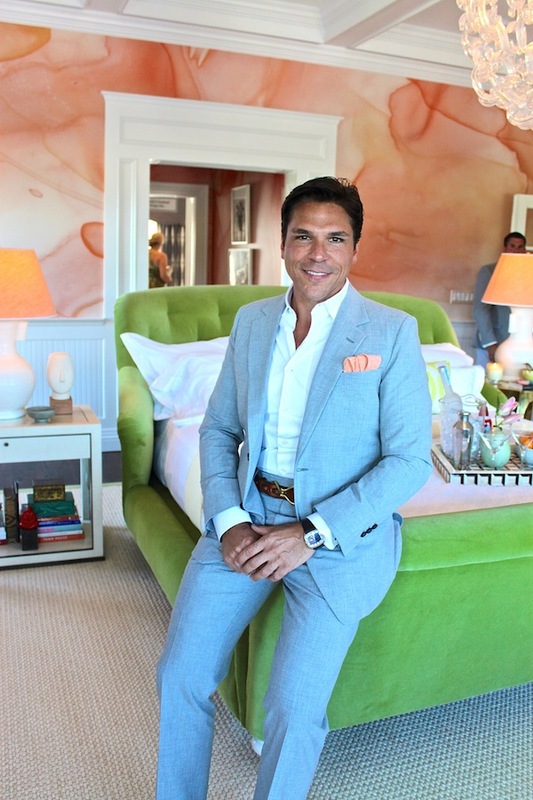 That’s a beautiful Vincente Wolf designed club chair in the background on the right. 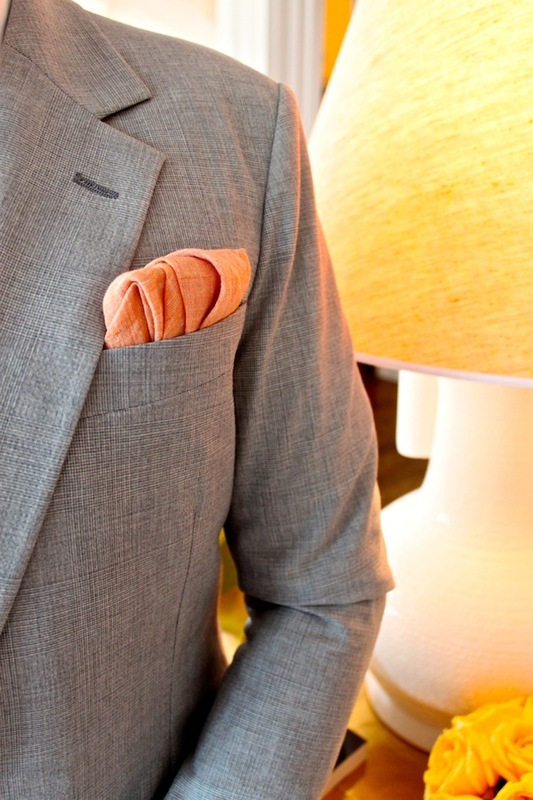 And leave it to Passal to include this sharp sartorial detail – pocket squares cut and hand sewn from the same C&C Milano fabric at Holland & Sherry that was used on the custom lampshades. It’s clear that Passal had a great time creating his ebullient colorful room!! This entry posted in design, furniture, interior design. Entry Tags: 2012 Hampton Designer Showhouse, interior design, Profiles furniture, Robert Passal Interiors, Savoir Beds, Tracy Hiner, Traditional Home magazine Bookmark the permalink. I love the behind the scenes sense of humor. It shows in the playful coloration. Love the details. That paper….oh my word. HA! I went to college with Rob, as someone who knew him back “in the day” I’m not surprised to learn that he still maintains his cool, down to earth personality despite all his success…needless to say I’m a big fan of his work too! This post is so entertaining on so many levels! Ha! 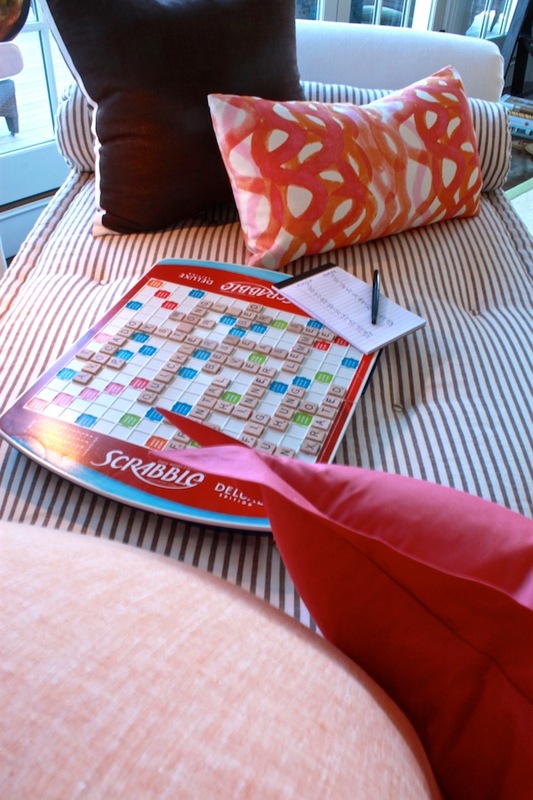 I’m laughing reading the Scrabble board; so fun! Love the humor and back story he shared. And talk about a room, bold, vibrant, exciting, and colorful. It reminds me of South Florida! The bed – in the luxurious velvet green fabric – is wonderful! 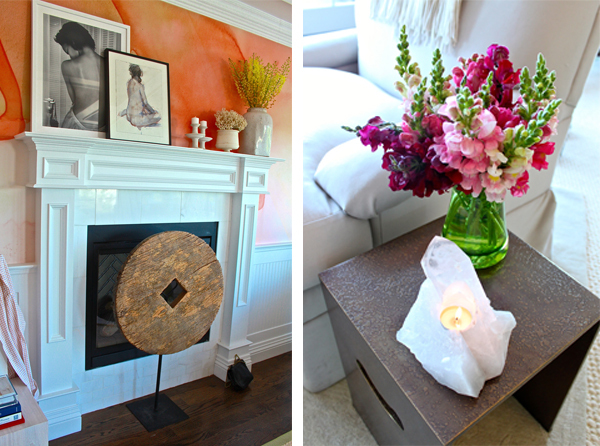 It is so fun to know the inspiration and see it transformed into the room. The walls are spectacular in that washed large sensuous orange hue. Thanks Stacey for sharing! can’t not smile at this room! the blue ceramic lamp is my favorite. 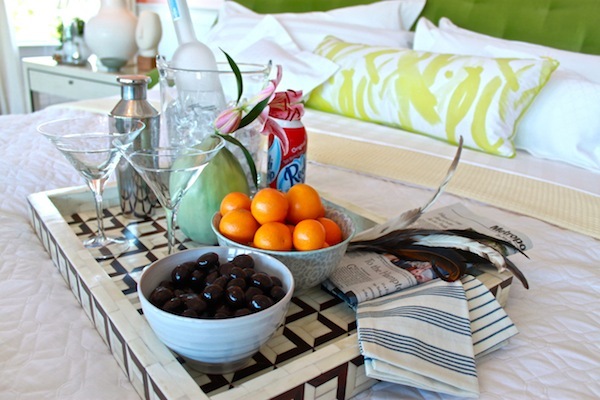 I’m with Ridgely….oh the bed! I opt for blue rather than green but oh that bed!! We had an inkling Robert’s room was going to be fabulous but we’re blown away by his creativity and artistic touches. Who knew he was such a fan of Scrabble? Thank you for sharing this beautiful room! Thank you C&C, I truly appreciate the kudos. Lots of fun…but the bed is totally in the wrong place! This room is stunning. So glad you called it out on your blog. Love Robert Passal…talented, funny, handsome–seriously the bomb! He injects glamour, style and that certain special “thing” into everything he does. I am wondering if the crystal candle holder is quartz or selenite..? The crystal candle holder is actually quartz. I’d give you the source for it but in my old age I truly don’t remember…. 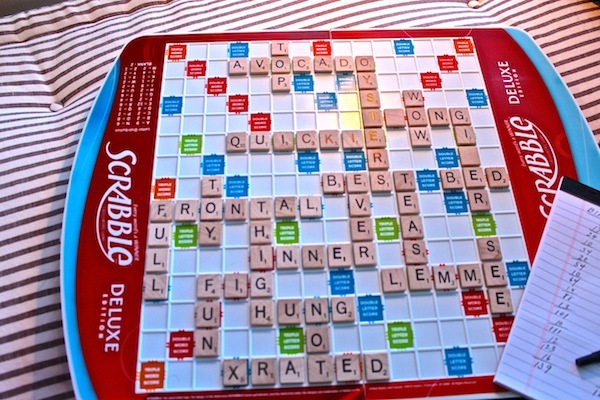 Haha, luv the scrabble board! That’s the Rob I know and love! 81 queries in 0.582 seconds.